This article is 2812 days old. Windsor’s Broken City Lab, “an artist-led interdisciplinary creative research group that tactically disrupts and engages the city, its communities, and its infrastructures to reimagine the potential for action in the collapsing post-industrial city of Windsor, Ontario” has a new project on the horizon. Famed for Cross Border Communication, Psychogeographic Walks, Text-in-Transit, and a number of other local projects, Broken City Lab, through the Art Gallery of Windsor, is asking for permission from the City of Windsor to create a new, public art project on the site of the future Downtown Windsor Aquatic Centre. 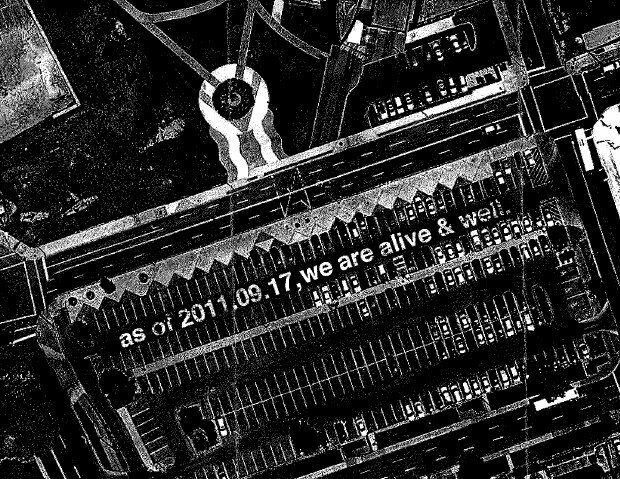 In a letter to the City Treasurer (and Project Leader for the Aquatic Centre) set to be accepted at City Council this Monday, the AGW’s Director Catherine Mastin is asking permission for Broken City Lab to commemorate the City of Windsor “on a global scale with a painted text that reads “as of 2011.09.17, we are alive & well”. Each letter of the phrase will be approximately 20×18 feet and will cover a square footage of 650-700 feet within the City of Windsor’s parking lots located just south of the Art Gallery. Mastin further describes the public art project as a way to coincide with the Art Gallery’s Biennial Exhibition of Contemporary art on September 17th and an avenue to make “a tremendous statement of collaboration between the City of Windsor and the visual arts”. Mastin ensures that the project won’t interfere with normal parking lot operations and that Broken City Lab, under the direction of Justin Langlois, invites the project to be walked on and driven over. While described as an “unusual proposal”, the project would bring “art to the very feet of the people of this city and thus breaks down any traditional conceptions of art being contained to sacred spaces”. The project would be visible from gallery windows on the AGW’s upper floors, and if various online mapping websites such as Google Earth, Bing Maps or Yahoo Maps update their satellite photography between now and the end of the proposed project in early 2012, the project will be visible to the entire world.